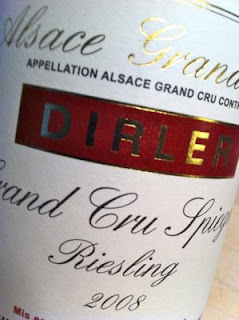 It is easy to make the false assumption that a terroir in Alsace need to have an ancient history to produce good wines. However, only few lieux-dits formed after the last glaciation have a strong reputation. These are Herrenweg (notable farmed by Zind-Humbrecht), Clos des Capucins (the vineyard surrounding domaine Weinbach) and Steinacker (of Ribeauvillé). The wines from these soils offer may not be the most complex, but are full of pure pleasure. 2008 Riesling Steinacker from Louis Sipp in Ribeauvillé is medium golden yellow. It has a already a surprisingly developed, rich aroma with petrol, honey, oranges and yellow apples. The taste is medium-bodied with plenty of fruit, a fresh and clean acidity and a certain astringency of grapefruit peel in the finish. A charmer with many qualities. Price: €10.